Public art, statues, and monuments have seldom been in the news more than in the past few weeks. 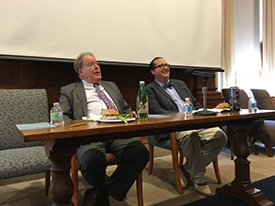 Figures from Christopher Columbus to Robert E. Lee, from Peter Stuyvesant to Stonewall Jackson have been topics for debate. Regardless of one’s political or cultural point of view, nearly everyone seems to have an opinion. Read an article by CAA-Getty alumni, Portia Malatjie, about the removal of a statue of Cecil Rhodes in South Africa. 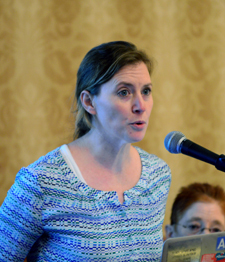 “I read with interest the Daily News article written by my Stony Brook colleague Michele Bogart. It is my impression that most scholars and thinking individuals advocate displacing (not destroying) the monuments to a museum or designated park with contextual didactic information (difficult and often impossible to place at their present sites). On a recent spring break my husband and I took our California grandson, a freshman at Davidson college in North Carolina, on a trip to South Carolina and visited a slave holder’s mansion in Charleston, a former plantation, and the Confederate Relic Museum in Columbia, all of which had insightful and fair didactic information about living quarters, the treatment of slaves, and the meaning of various symbols. It was a truly educational experience for all of us, but especially for our 19-year old grandson. In the public spheres that Confederate monuments now occupy, it is not possible to offer context; this can be done only in a more neutral and accessible location. General Lee himself was opposed to the erection of such statues precisely because of the divisive impact they would have on the country. Indeed, most of the confederate statues were installed beginning in the 1890s, considerably after the end of the Civil War. Their message would seem to have been to reaffirm Jim Crow and intimidate its opponents; and that is not acceptable. On the other hand, each statue or symbol should be given serious review by a committee of art historians, historians, and (in the case of NYC) the Public Design Commission (formerly the City Arts Commission) or other civic body, and/or other informed spokespeople, and in no case should a statue be destroyed. Photographs of the original site and other didactic material should be displayed alongside each work, and controversial and diverse opinions should be included. We must respect the artistic and historical value of the monuments and, at the same time, recognize the pain such images inflicted and continue to inflict on the people who were not part of those “regional civic groups” that worked for their installation. “Iconoclasm is deeply problematic in so many ways, but if the objects are conserved, then they do not get erased. I think the monuments should be kept in museums as a way to preserve them as historical objects. While I disagree with pretty much everything the president has to say, I worry, like him, that public monuments of all kinds will become the targets of such destruction and erasure. If we do not have reminders to teach us not to repeat history, then we will continue to do things all over again, as we are seeing presently. “Watching the statue of the Confederate soldier taken down with ropes in front of the Court House in Durham, North Carolina one cannot help remembering the toppling of the statue of Saddam Hussein and the removal of the Lenin statues in Soviet bloc states. These gestures may seem violent, unplanned acts of vandalism, but they are in fact just the opposite. They are expressions of consensus that these monuments have outlived their usefulness as public monuments. Their dismantling marks a shift or turn in a nation’s history, a rupture with the past, and a new understanding of what now shapes the civic realm. The idea of using the public sphere as a metaphor of rejuvenation is a practice that started in the Roman Forums. As Gregor Kalas argued in his book, The Restoration of the Roman Forum in Late Antiquity, the Romans of Late Antiquity used, reused and sometimes removed statues as a physical strategy to form a consensus over whom should be remembered and thus whom should continue to have influence. This attitude toward civic memorials is at work today and when the call for the removal or destruction of Confederate leaders comes forward it should be read not as wanting to erase history but of making space in the civic sphere for all to inhabit it without fear of history reviving itself. 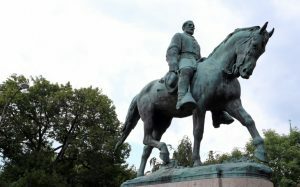 Monuments like that of the Confederate General Robert E. Lee in New Orleans and Charlottesville or the statue of the armed Confederate soldier in Durham North Carolina, when seen as involved in creating a civic consensus about who we are as Americans, are not just markers of historical facts, but also exist in the present moment shaping and ordering our nation’s social space. This strategic function of such physical monuments needs to be part of the larger public discourse on monuments and how making and breaking them are acts that guarantee or remove the sense of shared public space. From this perspective the monuments to the leaders and soldiers of the Confederacy can be seen as damaging symbols that have continued to haunt public space and the consciousness of African American citizens, leading many to feel a sense of estrangement rather than enfranchisement. “The destruction of a work of art should never be taken lightly. Yet the preservation of art should never take precedence over the preservation of life. These monuments are not only artifacts of the past; they speak strongly to – indeed, provide ammunition for – the economic, social, psychological and indeed bodily violence that so many Americans of color are subject to every day. For that reason, their status as works of art is not a good enough reason for them to remain public monuments, which are symbols of America’s most deeply-held values. If to remove a public statue from its original site is to destroy it, I think that destruction is warranted in this case. That said, these monuments are not all the same. Some of them are copies, and can be destroyed without significant artistic loss. Some of them are great works of art, or historically significant ones, which should be moved to a less public site: perhaps a sculpture park reserved for this purpose. Some of these works are even by minority artists. Those monuments, particularly those by black artists and architects, seem to me the best candidates for the compromise of “contextualization”: leaving the original in place, while significantly changing its meaning. A flat bronze plaque on the horrors of slavery is insufficient for this; new works, new stories, will have to be added, so that the original cannot function in its original messaging. History is not simple. Why should our public sculpture be? “I’m skeptical that art professionals have some sort of different or special stake in this debate by dint of their disciplinary sensitivity to a statue’s status as art. It sounds like the urge to preserve these statues as ~art~ means affording them a dubious sense of aesthetic autonomy, one that allows them to stand outside their social/political/historical function. I don’t think a statue’s existence as art ever separates it from the fact it is designed and erected to instil a particular historical/political/ideological order, a function that goes well beyond the object’s institutional/cultural/disciplinary boundaries. The aesthetic and political questions are one in the same. I’m very much in favour of devaluing the legitimacy of racist figures by undoing their canonization as statue-worthy. I think their removal demonstrates a necessary intervention in the construction of public and social space, affirming art’s agency in doing so. I think there’s a big difference between removing statues and erasing them: rather than wipe away historical artefacts which testify to a troubling history (to put it vulgarly, “censoring” them), the visible removal of a statue can exhibit that intervention in effective ways.” — Edward B. “1. It seems crucial for Art historians to help tease out which of these public cultural objects are “art” and which are not. While originality is not determinate of “art”, the fact that many of these objects are identical, “factory-produced” suggests that they really ought to be viewed as a set rather than in isolation. That is, to challenge your prompt: many of the objects at stake right now are not related to specific historical figures and make no substantial claims for their depiction of specific people (only of generic ideas, like, problematically, “heroism”). 2. It seems crucial for Art historians to more firmly establish the context in which so many of these objects were commissioned, made, erected, and celebrated – so often these truths do not match public perceptions. That so many Confederate monuments post-date the war by SO many decades, and that they coincide with a cultural campaign to recuperate the “lost cause” of the Confederacy and reassert white supremacy in the Jim Crow era, should be more clearly articulated. Not teaching about the history of these kitsch objects (on grounds that they lack aesthetic value, perhaps?) has allowed for mythologies of their historical value to circulate amongst white publics. 3. These objects often APPEAR to be monuments to individuals (or groups of individuals), but so many of these are actually more like flags – generic symbols of collective hate. They may wear the white costumes of a Beaux-Arts aesthetic, but these statues form a perpetual and stationary KKK march through our public lands. It is a particular cruelty that they are in state-sponsored spaces. The state, in a rather patronizing interpretation of First Amendment “freedom”, thus sanctions these hate-objects (in the same way that hate-speech is sanctioned); because that which appears to be “speech” or “expression” (even if it is instead violence, and regardless of the context of its speech-power) is protected from government censoring, those who are within the public space of that speech or expression are forcibly compelled by the state to hear or see (or leave the space of the public, removing themselves from the public). 4. It is IMPERATIVE that we all listen when people of color say that they are harmed by the presence of these objects in public spaces. What imagination of “public” do we have for the 21st century if it excludes the feelings of so many Americans? Not listening to people of color is how white people perpetuate white supremacy (even if unknowingly). Those of us who wish to disavow white supremacy must TAKE ACTION to stop it. Whenever possible, we must follow POC-led movements in THEIR proposed solutions for dismantling white supremacy. Hunter O’Hanian, CAA executive director, recently spoke to the artist Holly Hughes about proposed budget cuts for the National Endowment for the Arts. Hughes is known for being one of the NEA Four—artists whose work was described by Republican lawmakers as controversial and even pornographic. The debacle over the NEA Four led to the closing of the federal agency’s program of giving grants to individual artists. O’Hanian and Hughes discuss ten points that originated with the Heritage Foundation, a conservative think tank that advised Trump on his recent federal budget proposal. The two take on each suggestion point by point, offering a rebuttal to the Heritage Foundation’s logic. Though we know the most recent budget does fund the NEA and NEH through the fall of 2017 with a small increase in funding—and we are thrilled about that—we do not believe we are in the clear. When funding is allocated again in the fall this conversation should serve as a reminder to why the arts and humanities are so important to our world. 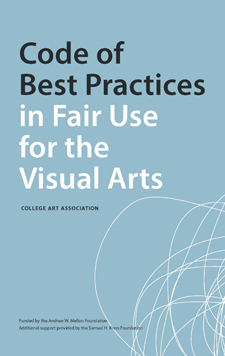 The College Art Association (CAA) has published the Code of Best Practices in Fair Use for the Visual Arts, a set of principles addressing best practices in the fair use of copyrighted materials based on a consensus of opinion developed through discussions with visual-arts professionals. It will be a vital resource for everyone working in the field, including artists, art historians, museum professionals, and editors. 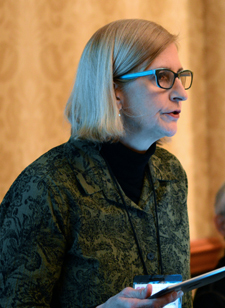 Initiated by CAA in 2012, the multi-year effort has been led by the Code’s authors, Peter Jaszi and Patricia Aufderheide, professors of law and communication studies respectively at American University and the leading experts on the development of codes for communities that make use of copyrighted materials in their professional practices. Analytic Writing: When may scholars and other writers about art invoke fair use to quote, excerpt, or reproduce copyrighted works? Teaching about Art: When may teachers invoke fair use in using copyrighted works to support formal instruction in a range of settings, including online and distance teaching? Making Art: Under what circumstances may artists exercise fair use to incorporate copyrighted material into new artworks in any medium? 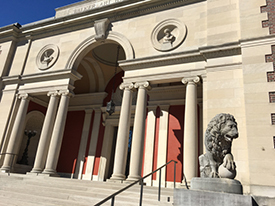 Museum Uses: When may museums and their staffs invoke fair use in using copyrighted works—such as images, text, and time-based and born-digital material—when organizing exhibitions, developing educational materials (within the museum and online), publishing catalogues, and other related activities? Online Access to Archival and Special Collections: When may such institutions and their staffs claim fair use to create digital preservation copies and/or enable digital access to copyrighted materials in their collections? In January 2014, CAA published Copyright, Permissions, and Fair Use among Visual Artists and the Academic and Museum Visual Arts Communities: An Issues Report, a summary of one hundred interviews with art historians, artists, museum curators, editors, and publishers describing issues related to the use of third-party images in creative and scholarly work. 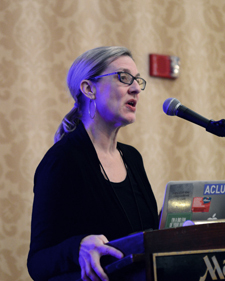 The Issues Report—which revealed significant challenges to creating and disseminating new work because of actual and perceived limitations of copyright—was the subject of ten discussion groups held last summer throughout the country with visual-arts professionals who deal with fair use and copyright issues on a daily basis. The Code is a result of this extensive research. 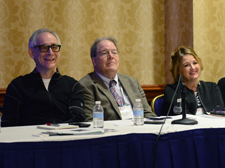 During CAA’s 103rd Annual Conference in New York (February 11–14, 2015), the principal investigators of this project and authors of the Code, Patricia Aufderheide and Peter Jaszi, will speak publicly with Judy Metro, editor-in-chief at the National Gallery of Art and chair of CAA’s Committee on Intellectual Property; Jeffrey Cunard, cochair of CAA’s Task Force on Fair Use; and Christine Sundt, editor of Visual Resources: An International Journal of Documentation and former CAA board member. The session, which will take place on Friday, February 13, from 12:30 to 2:00 PM at the New York Hilton Midtown, is free and open to the public. 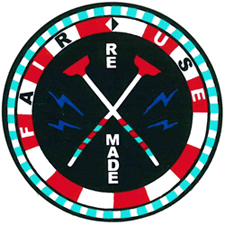 CAA’s Code of Best Practices in Fair Use for the Visual Arts is funded by the Andrew W. Mellon Foundation with additional support provided by the Samuel H. Kress Foundation. The College Art Association is dedicated to providing professional services and resources for artists, art historians, and students in the visual arts. 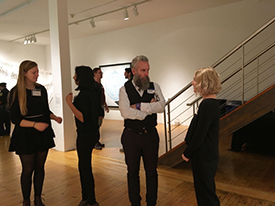 CAA serves as an advocate and a resource for individuals and institutions nationally and internationally by offering forums to discuss the latest developments in the visual arts and art history through its Annual Conference, publications, exhibitions, website, and other programs, services, and events. CAA focuses on a wide range of advocacy issues, including education in the arts, freedom of expression, intellectual-property rights, cultural heritage and preservation, workforce topics in universities and museums, and access to networked information technologies. Representing its members’ professional needs since 1911, CAA is committed to the highest professional and ethical standards of scholarship, creativity, criticism, and teaching. For more information please contact Janet Landay, CAA fair use initiative project manager, at 212-392-4420. To contact Patricia Aufderheide or Peter Jaszi, please contact Kelly L. Alexander, director of public relations, American University, at 202-885-5952.